Hi again, well, with the rain finally stopping on the day we got out of Theodore, thankfully, and having a few drinkies that night and a rest day the next day, it was back on deck Thursday 30th December for a 7am start. Our initial task was to transport by boat, the local electricity people down the high tension power line corridor to clear away debris from the towers. 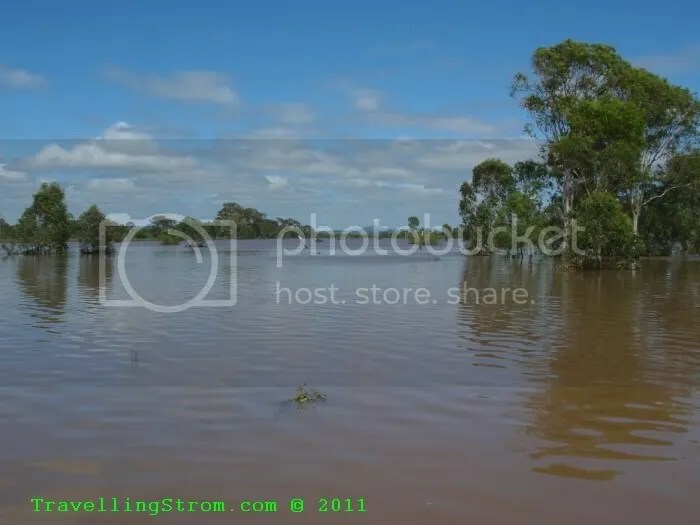 Well, that was the original plan, just as I had my brekky cooking(egg frying, bacon nuking, teabag dunking and toast toasting) I got a call from HQ, get here right away because a dude in a rubber ducky was last seen heading downstream out of control in the raging current!!!! Bugger, turn it all off and on the bike asap! 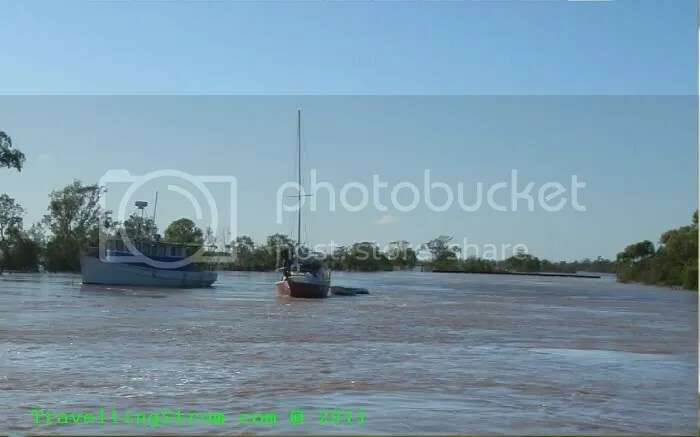 We launched the boat from the road and through the entry gates of the local motor boat club and headed downstream around the corner, where a lot of boats had been moved to be out of the current, then the next corner down past a fishing trawler and some more private boats. 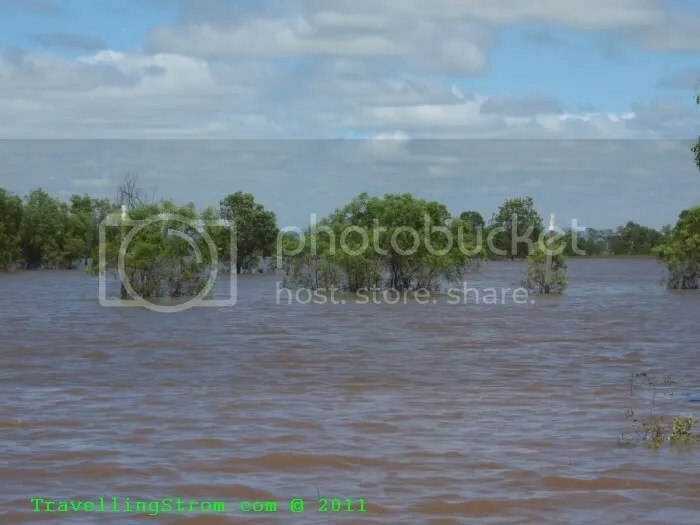 We figured that as this was a dog leg, it would be nigh on impossible to get around here due to the current flow, he would have to get taken over/through some barbed wire fences and across a tree filled paddock before ending up here. We headed back upstream and took a detour along Gavial Creek, this is straight down from where he was seen and if he was in control, a likely spot. Lo and behold, we spotted a yacht and a fishing vessel and the yacht owner turned out to be who we were looking for!!! 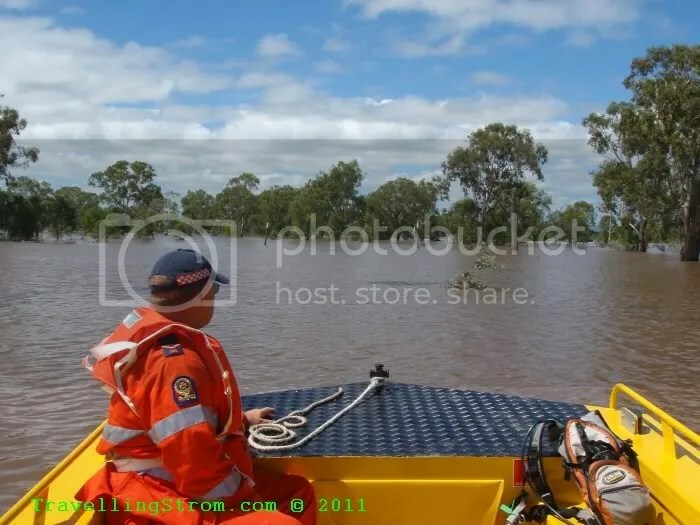 He wanted to check his boat mooring as it had no motor and he was concerned. Needless to say, we took him and his tenders(one fibreglass, one plastic Woolies variety, both without motors) back to our launch point and handed him over to the boys in blue for a ‘little chat’ 😉 In this next photo, his yacht is red, but pay particular attention to the blue fishing vessel as it gets a mention later on. 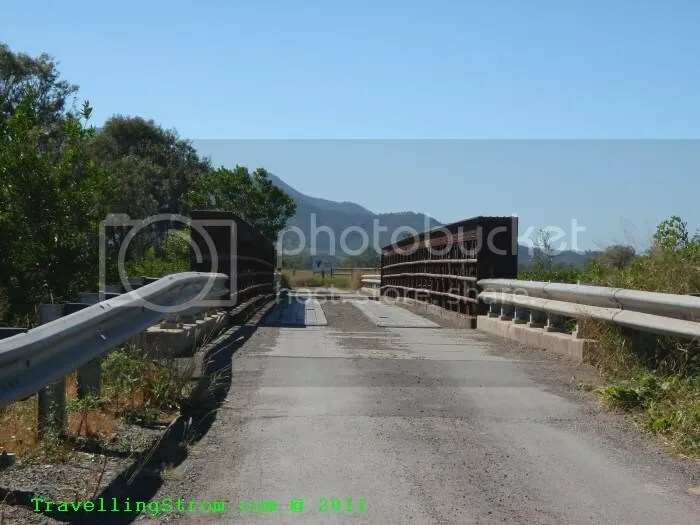 For those that do Geocaching, just behind the boats is Gavial Creek Bridge, you can just see the top span of the metal rail, the black line just to the right. 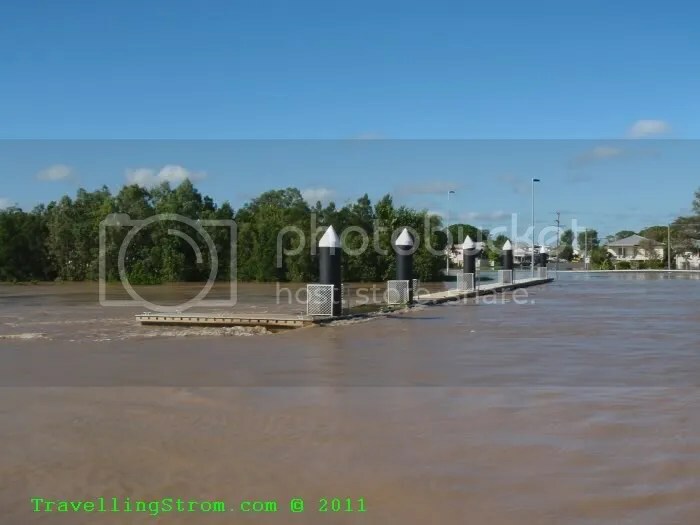 Well, normally that bridge has a tidal clearance of 3-4m under the deck, so you can see the difference. I took this next picture a few months back, I was approaching from the right hand side, that should give you some idea. OK, excitement is over for the moment, but it is a bonus to go searching for a ‘missing person’ and come back with a live body, not our usual outcome at all sadly, but a welcome change today 🙂 Anyway, we had lost our original task(power workers) so next is to negotiate a local lagoon and see if we navigate the boat along a marked corridor for access when the roads are cut. 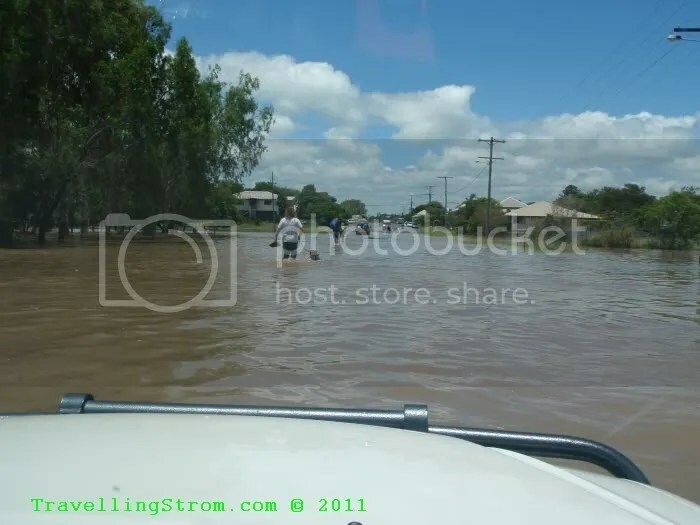 Basically Rocky is serviced by the north south highway which stretches along the east coast from Sydney to Cairns, it is called the Bruce Highway. 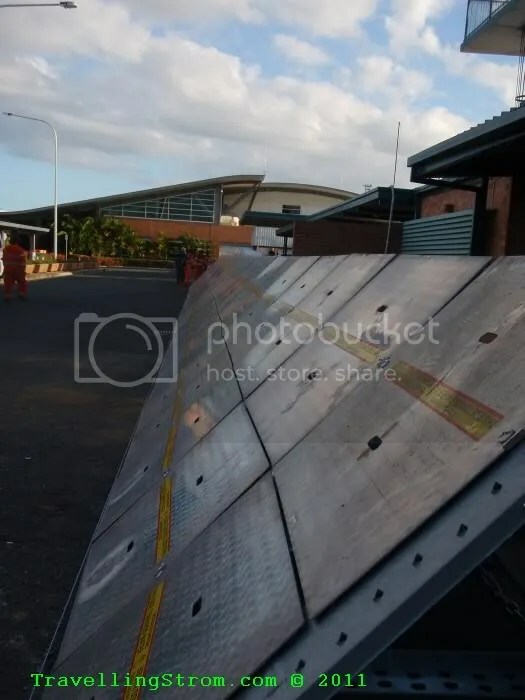 From Rocky west the Capricorn Highway services a small town called Gracemere but it is also the direct link to the western coalfields and to the Qld border. 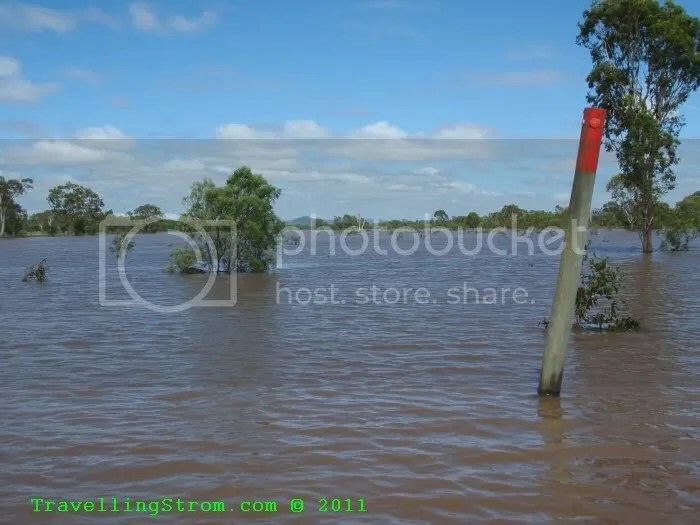 The roundabout at the southern entrance to Rocky will go under water at a certain river height, around ~8.5m. 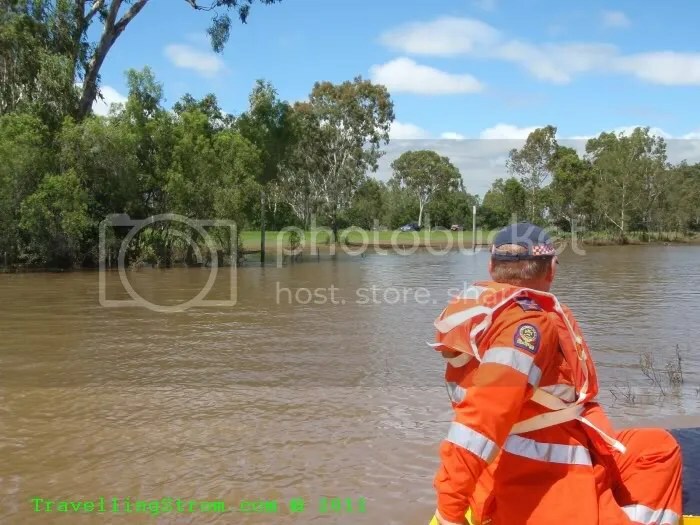 After the 1991 flood, a corridor was mapped through some paddocks and along roadways from the local Rugby Union grounds, to a point on the Capricorn Highway that was above water level, this meant supplies and emergencies could still be looked after using our floodboats. We found during the next hour that the ‘pathway’ had not been maintained as it should and there was a lot of ground cover and suckling trees in between the marker posts(vertical tree trunks with white or red paint) and that we would need to cut some wire fences and remove star pickets to make this a useful passage. 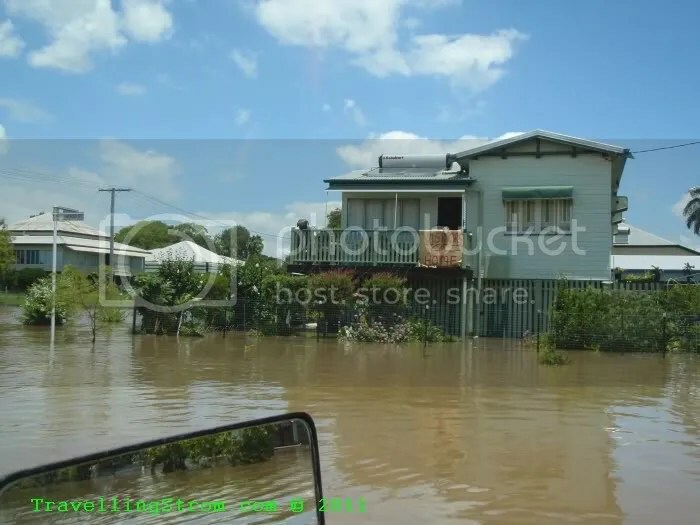 In the 2nd last photo you can see the roadway and a picket fence near the waterline, they need to be removed and the water is still to low to get that far by boat at this stage. And the last photo shows the amount of grass we picked up from the low water!! The boat crews swapped over so we could all get familiar with the route, even though it is not complete yet and the next crews in marked the trees and posts with fluro marker tape for better visibility. 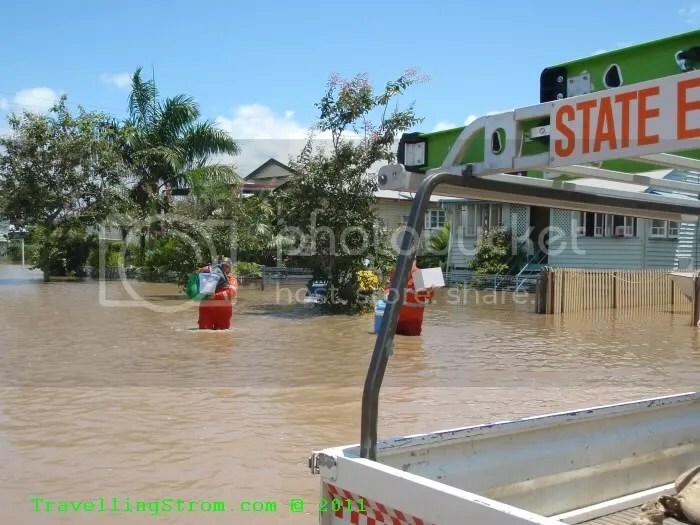 So, our crew changed and split up, I was now part of a new team using one of our 4wd’s, to deliver food and evacuate some people from a suburb in the low part of town called Depot Hill. 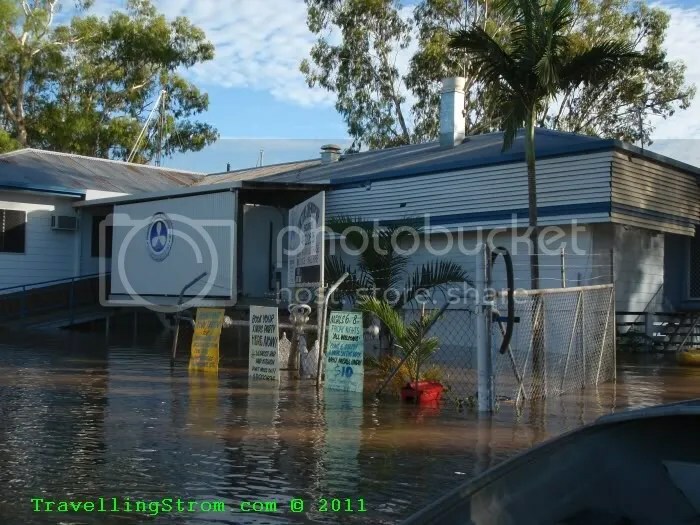 I used to live here and in fact I bought a house here just after the 1991 floods(it never got wet), so I know it well. The crossing was just at the level where we could drive through with care and we managed to achieve the tasks set out for that afternoon. Around 2pm I was rushed back to HQ as I was one of those(of 6) who had recently done a course on how to erect a portable flood barrier. 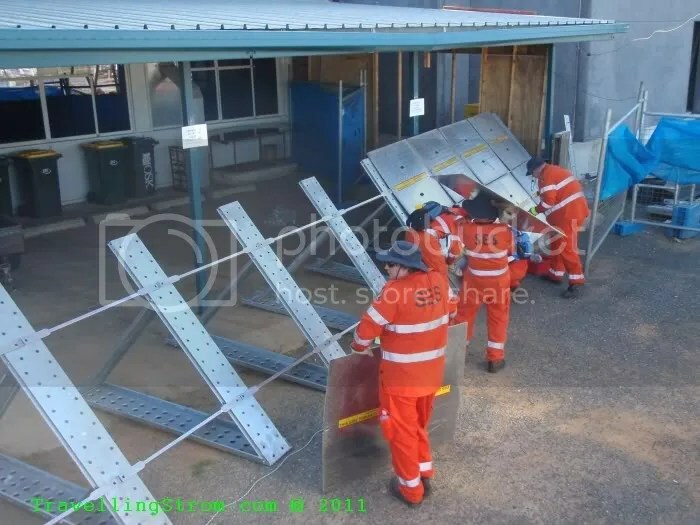 This is a ‘mechano’ style unit, we had in town at this moment 500m of parts which would turn into a 1.5m high waterproof(we hoped) barrier. 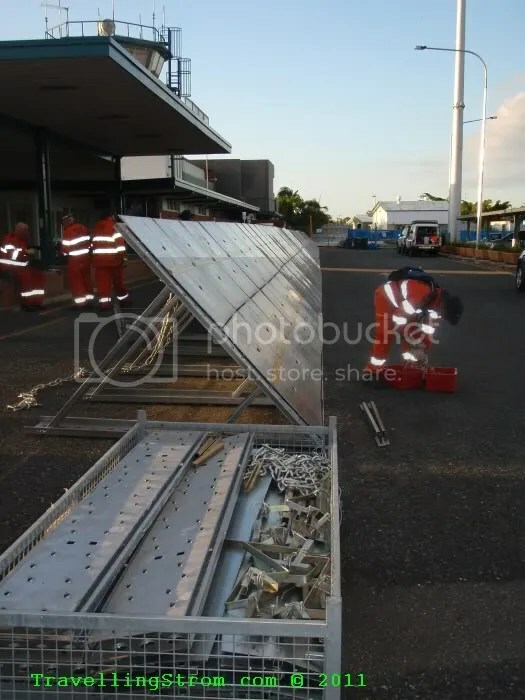 There was another 500m coming down from Townsville that night and our task that day was to start assembling the barrier around the airport control tower and arrivals/departure building. Once we got started and worked out a system with the available troops(10) we made good progress with a better understanding of what was needed tomorrow. The airport should stay dry until at least Sunday/Monday, so we had some time. And with more SES troops arriving by plane over the next few days from the north of the state, things should work out. We finally packed up at 7pm and headed back for a great feed put on by our local welfare staff at HQ before sorting out tomorrows tasks. Mine would be away from the airport and back on the boats somewhere. 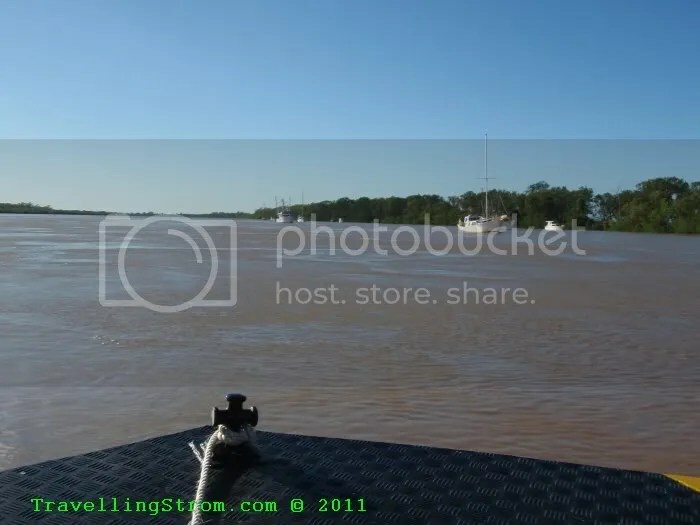 This entry was posted on January 3, 2011 at 18:56	and is filed under SES. 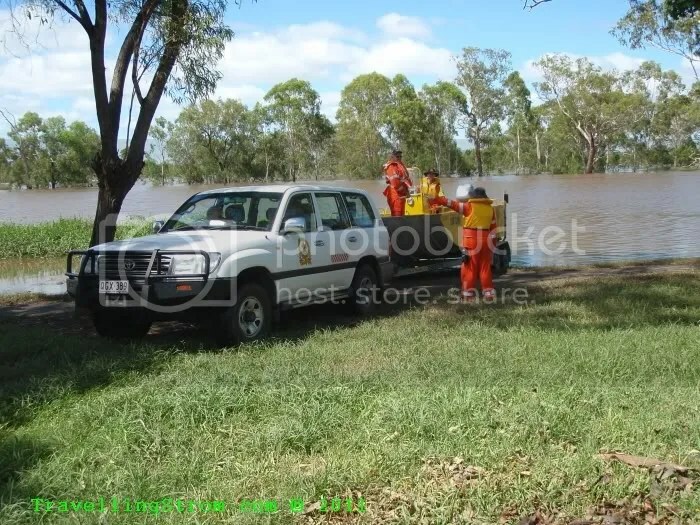 Tagged: Flood, Floodboat, Rockhampton, SES. You can follow any responses to this entry through the RSS 2.0 feed. You can leave a response, or trackback from your own site. I knew you had to go ‘Honda’ at some point! 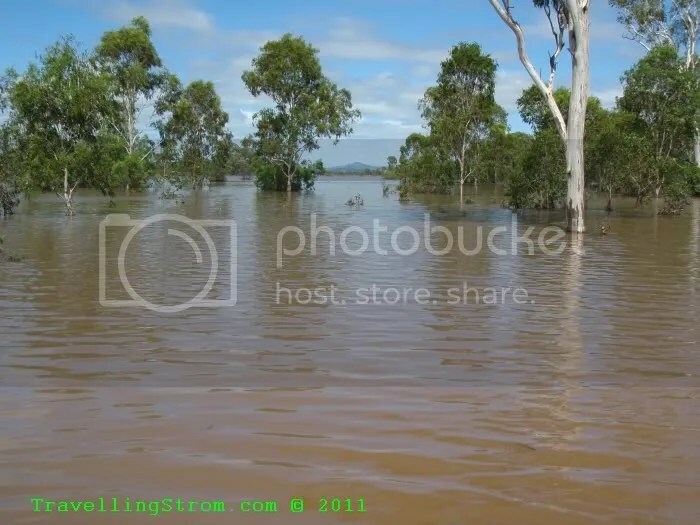 NICE TO SEE OUR FLOOD BARRIER SYSTEM BEING USED. THE QLD GOVT SHOULD HAVE SEVERAL CONTAINERS OF HIS SCATTERED AROUND THE STATE FOR QUICK ERECTION. 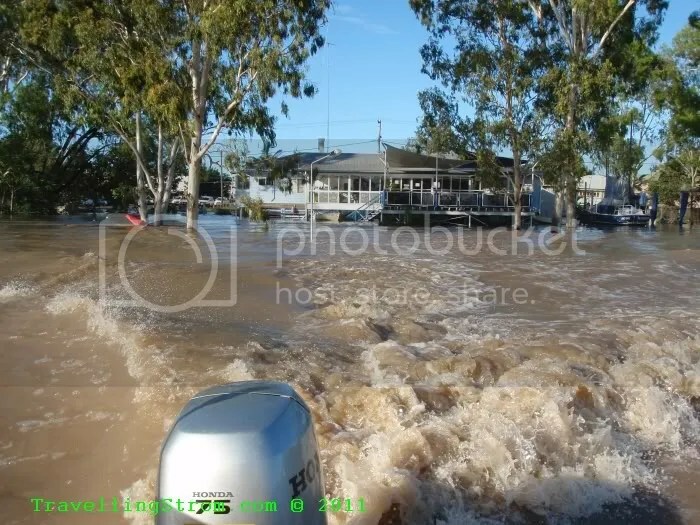 IT WAS USED IN CHARLEVILLE IN 2008, BUT THE GOVT ONLY BOUGHT 1KM. THEY NEED ABOUT 100KM!!! 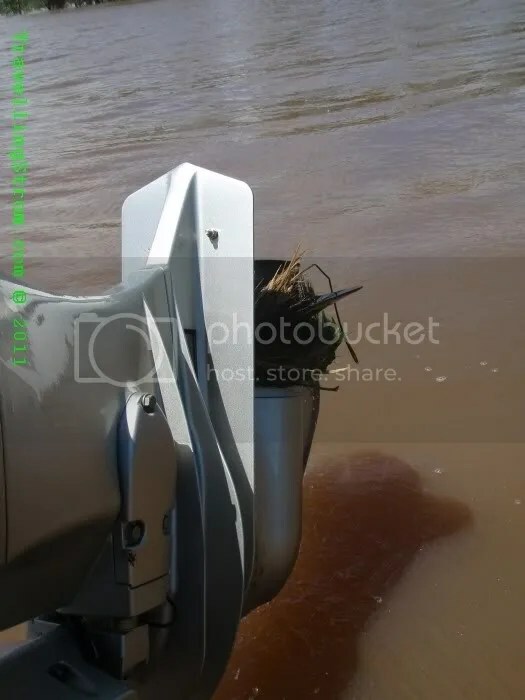 Rich, I’d interested in seeing how that Mechano set works once the water gets up to it. It looks a little leaky. But it would be better if it did not need to be tested. I think you’ve had enough water to last you a while. The finished system has a sheet of pool liner placed across it and stretches 4m in front and is weighed down with more of that chain.